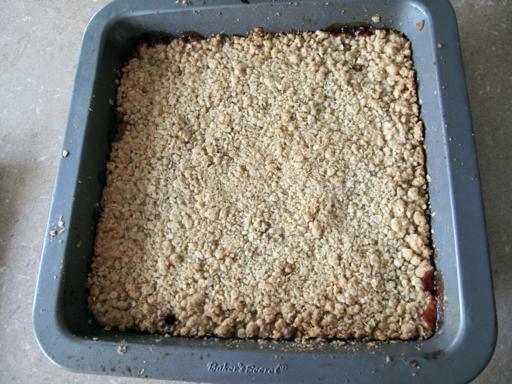 This is your basic crumble or oatmeal bar base, with cranberry sauce or jelly in the middle. I am rather proud of myself and used my own homemade highbush cranberry jelly from the fall and it was fantastic! That could be that I was just happy to use something I made myself, doesn’t it almost always taste better? 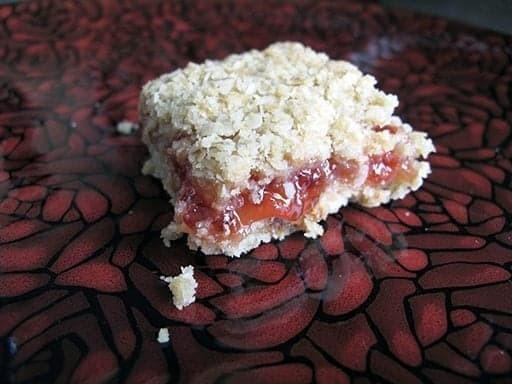 This would be amazing with more jelly in the middle and then served as a “crumble” instead of a square, with vanilla ice cream on top. Warm from the oven and delicious ice cream….yes please! 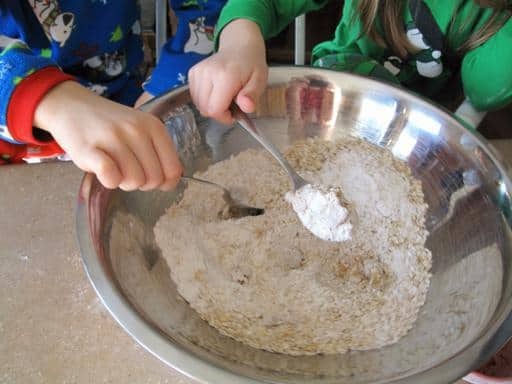 This was a Sunday morning baking project so of course, there are little pajama clad children “helping” me bake. Which was more making a mess but they sure were proud of themselves and I love to get them involved. Here they are mixing the first 4 ingredients. Once the kids are done “helping”, take the butter and cut it in, until it’s perfectly crumbly. I find that rubbing it between your palms lightly works so well. 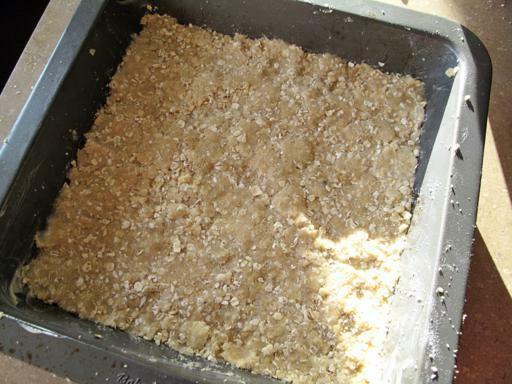 Firmly press 2/3 of the mix into a greased 9×9 pan. Once the bottom layer is done, pour the cranberry sauce, or jelly, on top. If you are making more of a crumble, add another cup of filling. This is my homemade jelly so it’s very clear and has no crushed berries in it. It tasted fantastic. I would love to try making my own cranberry sauce and making a crumble out of this. Bake in a 350 degree oven for 35-40 minutes until it’s a lovely brown like below. Cool this completely and then slice into 25 squares. It is crumbly but if you are patient and cool it for a long time, they hold together. 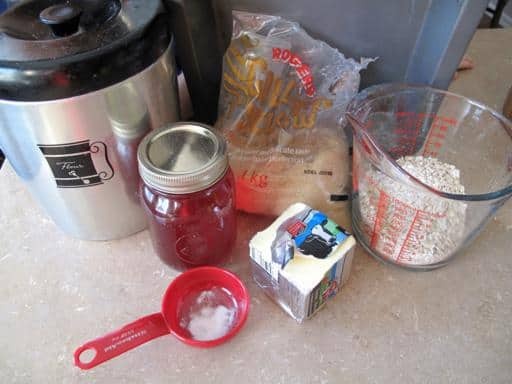 This is a basic oatmeal bar base you can use any flavor of jam with. Cranberry jelly is perfect for Christmas or Thanksgiving, or any holiday occasion. Mix the first 4 ingredients together, then take the butter and cut it in, until it's perfectly crumbly. I find that rubbing it between your palms lightly works so well. Firmly press 2/3 of the mix into a greased 9 inch x 9 inch pan. 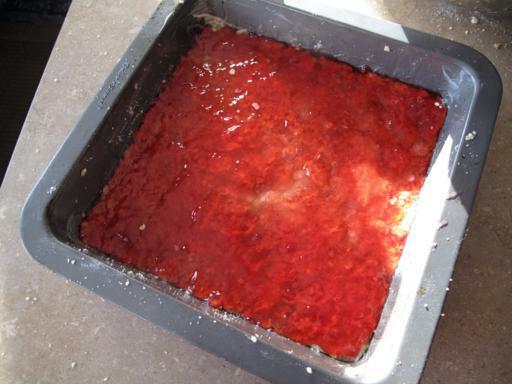 Once the bottom layer is done, pour the cranberry sauce, or jelly, on top. 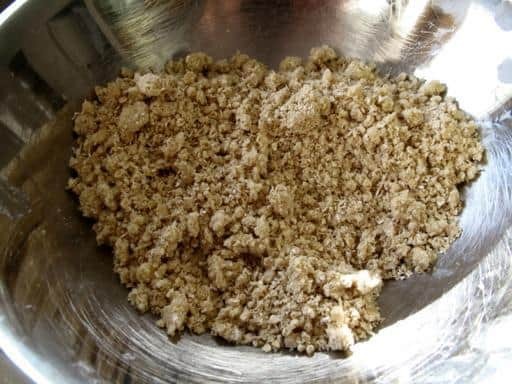 If you are making more of a crumble, add another cup of filling. This is my homemade jelly so it's very clear and has no crushed berries in it. Bake in a 350 degree oven for 35-40 minutes until it's a lovely brown like below. Now, that is a great way to use up the jelly! I have been using the syrup on ice cream (naughty me) and it is SO delicious! I was thinking of a pavlova with a high bush syrup gelee. Now, doesn’t that sound refined! I probably won’t make the squares. I do not have kids and I do not need to eat them all myself. But, you have me going. Surprise muffins. I made those with my students: a dollop of jam in the middle (dough half way up, jam in the middle, top with dough)… or thimble cookies. THOSE I will definitely do with this jelly next year when I bake (as I was not well enough this year. )… and hmmm….instead of sugar, mix it with apples in a crisp. Oh YUM. OK. 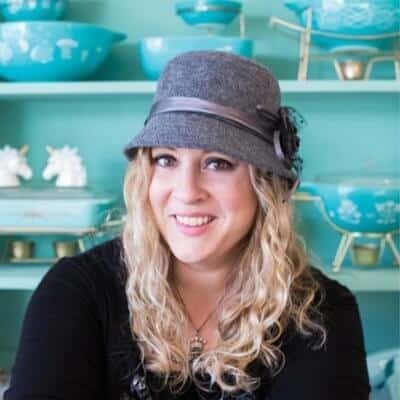 I just might make those bars… but, I love the idea of the gelee, too. Where are accents for the comments?